Here’s Day 9 of the Divine Mercy Novena! Sometimes God answers prayer on His time not ours. When this novena was finished, there was no news forthcoming regarding my brother’s cancer results. Well, He gave me the news I was praying for last evening (4/24). The bone scan is completed and there is NO CANCER ANYWHERE! THANK YOU, THANK YOU, JESUS!!! Thank you! My prayer was answered this morning. Jesus, I trust in you! Thanks to John-Paul and Annie for offering us the chance to pray together via this excellent site! I loved praying along with the video. Here is a prayer that contains many of the specific intentions I prayed on different days of the Novena. I edited and revised today, and intend to keep praying this “HildeGarden” prayer daily. Almighty Father, I don’t deserve to breathe or to sing; all is provided by Thy Grace and Mercy. and the precious taste of Thy Body and Blood in First Communion, which unites me with the body of the church and the communion of saints in heaven. I beg of Thee, help all souls find peace in this life on earth, by drawing them to walk in Thy Light toward our Risen Lord Jesus. May Mother Mary guide ever more ignorant and sin-filled atheists and agnostics into our beautiful Church, home of our hearts’ true yearnings. May I receive the guidance of the Holy Spirit in finding a vocation that makes use of the skills Thou hast taught me. Let this vocation cleanse and scrub away the ingrained flaws in my character, as a mother bathes her stubborn child nightly after its misadventures in the dirt and mud. Father Almighty, please ​​​send me apt circumstances to deftly shape my soul so that I can become sincere, devout, humble, simple, loving and forgiving. Please ask Thy Son to heal the deep wounds in my heart by accepting me into the constant embrace of His Sacred Wounds. I thank Thee for the gift of the Precious Blood of Thy Son now warming my arteries. This miraculous transfusion gives me the strength of a 33 year old man’s divine Heart, and buys me more time (if it be Thy will) to live as Thou intend. Keep prying open my arthritic hands which have grown into claws, bent over and gnarled. and above all wallowing in half-hearted indolence and indecision. Lead me where the songs call my name. Show me a soft place in the Hilde-Garden, a spot where I may blossom under the sun, drink in the rainy days, and sleep under the shade of great saintly trees. I know the path there is winding and rocky. I am ready to walk with Thee. May Thy will be done and may I learn to accept whatever is offered in this earthly life. In the name of the Glorious Creator Father, and of the Sacrificial Priest Son, and of the Singing Sacred Spirit, Amen. 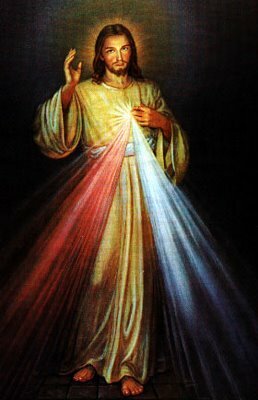 I thank Jesus for the Divine Mercy Novenas. Please pray that my family will return to our Lord and his holy Catholic Church. LORD, please heal the relationship of mommy and nanay and bless us especially fot this weeks special event. My Lord Jesus I pray that you heal my Mother, sustain her, be her strength and restore her to good health that she may leave the hospital and return to her humble home. Also, Most Merciful Lord Jesus, could you please, please reunite my Daughter and I as a loving father and daughter and family so I can be a good Dad and a good example of life lived in Faith with Christian values and love. prayer for the healing of my spouse Loreto from recurrent infections due to bile leak, that his liver will be healed completely, his irregular heart beats will be resolved, and his narrowed coronary arteries will be healed. Jesus we trust in You. Thank you for your love and mercy on us. Please convert tim and our young boy john to the Roman Catholic church from lutheranism. Keep my anti catholic father in law who is a lutheran pastor at bay. Please help. Granddaughters living with men as if married and having babies, not going to church or hearing Gods word. Forgive them and knock them up side the head to wake up to the YOU have waiting for them. For Jesus sake please pray for Fevziye, Faruk and Ali, Tahsin, and for me Mufide and for Irfan, Serif, Ismail, Mehmet, Nedime R and all my family members and all my intentions for God’s Will. And for my father Mehmet who is a very old man to receive the Grace and the Holy Ghost and to get baptized and receive the Sacraments as soon as possible with all the family members as soon as possible. And please pray for the soul of my mother Nedime and all dear ones living and dead. and for the soul of my grand mother Zeynep and all her dear ones and all my dear ones souls in pargotory. And for Fevziye for healing tumor in her womb and in her urine and healing of her mind and all kinds of healings. And for healing of her livers. also when she sleeps oksijen does not go to brain, for complete healing and to lose weight and quit smoking and gambling. And for her healing after the death of her mother and for her spiritual healing and conversion and for gift of Pentecost with all her family members. And for Tahsin for healing of mind, memory, hip bone, cholesterol, blockage in heart artery, heart, and all kinds of healings. And for Ali, for healing of diabetees, heart, mind, memory and all kinds of healings. And for Mufide for healings of mind, memory, blockages in the legs, brain, memory, eyes, ears, imagination, breast, and hips and back, head and mind and all kinds of healings. And for Irfan for healing of hip, mind, family, heart and all kinds of healings. And for Faruk for healing of head, headaches, hip, mind, memory, heart, lungs, faith and all kinds of healings. And for Sherif for healing of cholesterol, knee, and all kinds of healing and for healing of family trees. And for Mehmet for healing of mind, heart, back, and all kinds of healings. And for Ismail for healing of DIABETES, heart, hip, mind, memory, family trees, faith and finance and all kinds of healings. and for Semra and all her dear ones for God’s will be done. And for Hikmiye C for healing of canser and her dear blood line family. And for Vedat P for healing of all kinds with all her dear family blood lines. Ragibe T for healing with her children. All my nieces and nephews for complete healings and blessings and protections. And for healing of all dear family members and all dear families. And for dear relatives and dear alewies. And for Bashar E. and family and his family and his people through out the world. And for salvation and protection of all. For Jesus sake please pray for me Mufide Mary R and all my dear family members and all my intentions for God’s Will. Holy Appirition of the blessed Mother to us and for our conversions, forgiveness, healing, blessings, protection, long lifes, Divine Mercy, Girfts of Holy Ghost and Grace, and salvations. Please pray for Fevziye R my sister and for all my brothers and my father, Please!!!!!! And for the conversion of my country Turkey to Christ. And for the Kingship of Jesus. Please pray for the soul of my mother Nedime and all her dear ones living and dead. God Bless you for all prayers and your sacrifices for us. DEAR FATHER GOD PLEASE IN JESUS NAME MAKE A WAY FOR THIS EVIL WOMAN, JEAN MY HOUSEMATE TO MOVE OUT INSTANTLY JUST AS SHE CAME. PLEASE LET US GET A VERY COMPATIBLE HOUSEMATE WHO IS THE TOTAL OPPOSITE OF JEAN WITH ME. PLEASE LET EVERYTHING FALL INTO PLACE THAT NEEDS TO GET DONE FOR JONATHAN H AND I TO BE MARRIED TO EACH OTHER VERY EFFORTLESSLY. PLEASE HELP ME GET ALL THE CONFIRMATIONS THAT IVE BEEN WAITING FOR. BLESS CHRISTOPHER SO HE MIRACULOUSLY FINISHES THE WORK SOONER AND BETTER THAN EXPECTED AND MEETS UP WITH ANGIE AND I. HELP ME TO GET BAPTIZED IMMEDIATELY AND HELP ME GET CAUGHT UP WITH MY RENT AND ALL THE DEBT AND LOANS. BLESS MY LANDLORD TATSUMI AND TROY WHO HAVE BEEN TOTAL ANGELS IN MY LIFE. SHOWER ME WITH YOUR ETERNAL BLESSINGS 24/7 SO I HAVE NO FEAR AND BECOME VERY CONFIDENT, HEALTHY, FINANCIALLY SECURE AND STABLE. HELP MY MENSTRUAL CYCLE TO BE REGULAR AGAIN. BLESS US ALL IN THE WORK AND OUR LOVED ONES. I LOVE AND TRUST YOU. AMEN. I pray that the ongoing court case (since 2014) may come to it’s final conclusion and that God’s Holy Will be accomplished. Whatever the outcome, may The Lord, his mother, and all the angels and saints that I have continuously called upon, especially my guardian angel Pietro Serafino, be ever at my side giving me the strength I need to persevere in this difficult trial. I thank God for the graces he has bestowed upon me and I know he will bring about good from the injustice that was done to me and my father (may he RIP) whom I hope is basking in the rays of The Lord’s never ending mercy. Amen. Most Powerfully Merciful Lord & Savior please hear my deepest concerns for my youngest sister B. M. I’m worried about her soul…. Only You, my Lord Jesus know exactly why riffs come about between us. I tried my upmost for a healing between us. Its seems on & off over these 18 years….Send forth your Holy Spirit to enlightened me as to what to do to heal our relationship. ??????????? ?Regardless what I do, constantly praying, being physically available, taking care of her daughter when she had to have treatment for chrons disease. Doing Novena, is never enough. My sister has a cold heart towards me extremely unforgiving. She has never come to me directly to right any wrongs or misunderstandings. I get the silent treatment only. Her daughter, Charlotte is my God-daughter & I’m worried about the negative impact my sister’s behavior has on her 14 year old daughter. Lord Jesus I place this burden at the foot of your cross. Amen ???? ???? ???? Thank you my Lord that Junne’s Radiotherapy and Chemo sessions had finished, but it took away his strength that is obviously shown in his body. I pray dearly for his immediate recovery, as he need and want to go back to work for his medications and other expenses i.e. bills, food, etc. He had lost his appetite and lose a lot of pounds, His sense of taste has gone bland, and cannot eat even soft food. Pls. dont make him lose hope. Aftr 1 1/2 months he’ll undergo ct scan to check if any tumor remained, and might have another bout of chemotherapy.. Grand him Lord a new life free from illness. Praying for healing for Raul and self. Perfect results. Negative ???? I’m at a crossroads – not sure what road to take. I wanna be with my fiancé however his past may hurt our future. Can we truly be washed away thru the mercy you bestow upon us? Can we be given a second chance – a clean one? I pray for people’s mercy and acceptance in some way Lord but I too know they perrsecuted you, it will happen to us. Help us God to rid the shame and the burden that blocks us from living with your glory. I really need you God. I need you so much. For those struggling through un/underemployment. For the healing of hardened hearts. For a growth in faith, hope and charity in all hearts, especially those of our wounded brothers and sisters. For the lost to not seek the riches of this world, but life eternal. For struggling marriages and for marriages that continue to be a beacon of light/hope to the unmarried and the married. Lord jesus I place my financial needs into your hands.I pray for financial deliverance. Lord my son tuition fees is due soon. Pl help me finance him.I pray to win and be victorious in my financial battle. I pray for my manifestation of finance and bookings for my husband to be granted by God. May my family and I be protected from people who has spoke badly to us and about us. May archangel cut the chords for anything that doesn’t serve us. Please Holy Mother Mary make me resist the temptation to take pills which make idle and impair my mental health. My only wish is to serve and make reason in a world which is becoming Godless and greedy. I am also aware of the many ordinary feats of compassion by those angels in disguise. In the name of the father. I pray for unity and love at my home. Keep us together so that in time of need we will be there for each other.